Eastern Style Long Fluted Point. 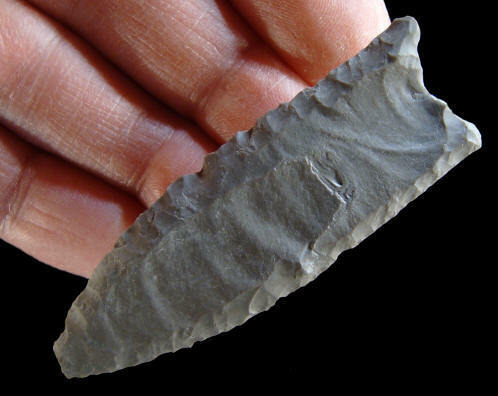 This fluted point was found several years ago in Otsego County, New York by Howard Arndt. It’s an excellent example of an eastern “thin” style of the “long fluted” points that have been reported in the region. 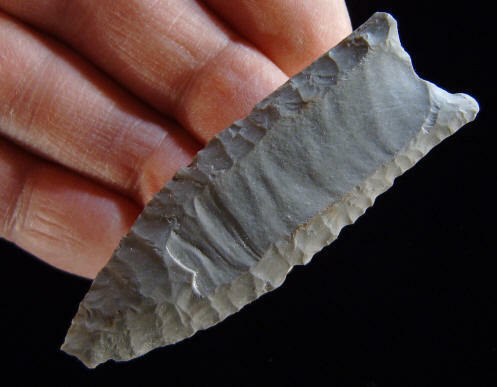 They are sometimes referred to as Barnes-Cumberland points or as Richard Gramly has described this example: “In the typological sequences of eastern North America fluted points, this specimen stands midway between Barnes-Cumberland type and Crowfield type” (Richard M. Gramly, PhD.). Similar points have been described by Perino as Barnes “Fluted” and he's also referred to them as “the Illinois Folsom in west-central Illinois and the Sedgewick point in northeastern Arkansas.” (Perino, 1991) This point is fluted to the point on one side with multiple fluting. It’s made of opaque gray Esopus shale and measures 2 13/16 inches (7.1 cm) long and 3/16 inch (4.5 mm) thick. This picture show the opposite side of the point which is fluted to the point with multiple fluting.